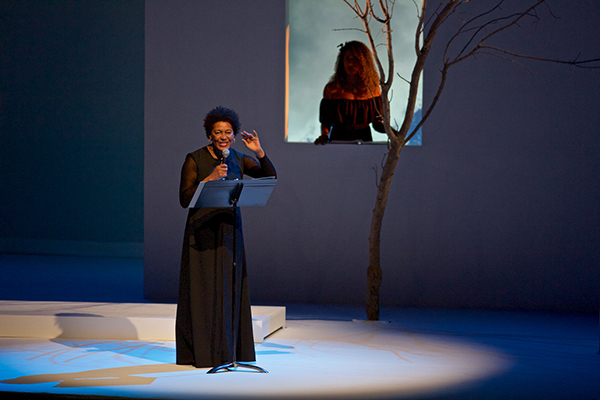 Carrie Mae Weems, an artist who strongly believes in the transformative power of art, discusses the nature of her work and its emphasis on our shared history. Generously sponsored by the Andrew Carnduff Ritchie Fund. Followed by a reception. This fall, the Gallery presents a special installation that coincides with Weems’s lecture and the September performances of her work Grace Notes: Reflections for Now at Yale Repertory Theatre. The works of art on view—notably Weems’s series Slave Coast (1993) as well as works by other contemporary American artists such as Titus Kaphar, M.F.A. 2006—offer a different perspective of the legacy of slavery and critically question the nation’s history. After the lecture, visitors are invited to view Weems’s and other artworks; the Gallery will close at 10:00 pm. Doors to the lecture hall open at 5:30 pm; if the auditorium fills to capacity, visitors may attend the live-stream lecture at the Loria Center, 190 York Street, Room 250, less than a block away from the Gallery.